In January, I was asked to take part in the Amgen Celebrity Ride as part of the Gold Country Metric Century. I was excited that I would get the chance to cycle on the same route the Amgen Tour of California cyclists would ride on. I saw myself speeding over the hills of Auburn with the grace and elegance of the pro-cyclists. The event was this past Saturday and while I wasn’t quite the Olympian I had thought I would be, a couple of the organizers told me I was probably the first woman to finish the ride. They said this was pretty good for a flatlander (that’s what the foothill cyclists call Sacramento dwellers). Whoo hoo! Not that it was a timed race, but you know I’m a little competitive so I did pedal my heart out the whole time. AND I totally loved the ride. 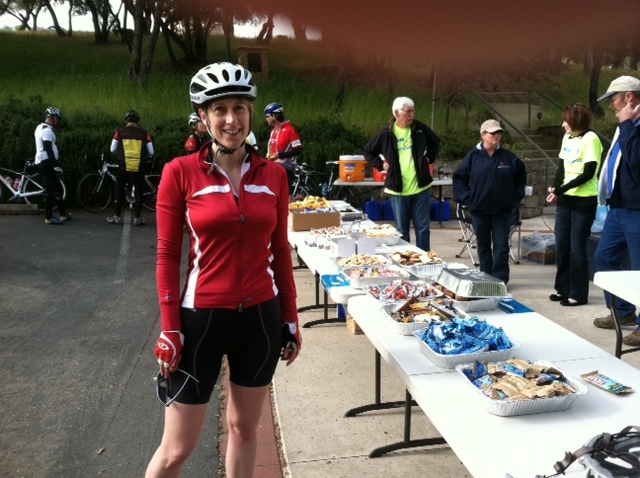 The Gold Country Metric Century is perfect for both novice cyclists like me and more advanced riders. It took place in Sierra foothills by Auburn in California and riders had the choice of doing the full 100 kilometer ride with 4600 feet of climbing or the 50 kilometer ride with only 2300 feet of climbing. I took the 50 km one – but next year I might do the whole thing as it wasn’t as exhausting as I imagined it would be. Sure there are hills. Um…actually, there are a lot of rolling hills, but the scenery is gorgeous. It’s all farmland, vineyards and trees. And the route takes you through Old Town Auburn and through a number of winding roads. It’s lovely. It’s also not crowded which a bonus. In total there were about 200 of us doing the route instead of the thousands of people that have shown up at other century rides I’ve done. When you have thousands of people, it feels crowded and a little stressful – especially if you’re like me and tend to go really slow up the hills. I’m talking grandma-walker speed here. I swear, on the flat areas I’m cruising effortlessly at 18 to 20 mph, but as soon as there is a little hill, I’m down to 5 or 6 mph. Pathetic really. Anyway, this ride only has a couple of hundred people so it’s peaceful and relaxing. You encounter enough people along the way to know you’re not alone, but never feel the pressure of having someone breathing down your neck. I was almost sad when it ended. It was the perfect way to spend a Saturday morning. Plus, all the proceeds from the event went towards the Auburn Community Cancer Endowment Fund. So a win/win for everyone. By the way, if you happen to be Auburn during Amgen (May 17), check out their other events.